Are you afraid when friends ask to use your bathroom? Worried they might peak behind your dated pink shower curtain and see the “gunked up” (not sure that’s a word) tile grout and rusted cast iron tub which lurks in this dark spooky alcove space you get to “enjoy” (sarcasm intended) daily? Your old bathtub is not the sexiest place in your home. You have to climb into this this space to shower every day, and its’ not as easy to do as it used to be. Since the tub is stained and nasty you wouldn’t dare take a bath in (if you had the time – which you don’t anyway). Why are you putting up with this poor functioning tub? 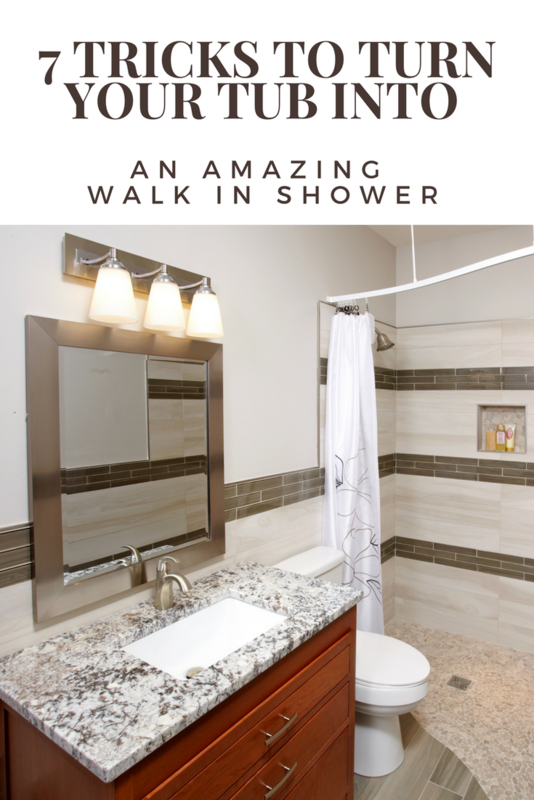 I’m going to tell you it’s actually possible to get a slick walk in shower – even if the only space you have for it is the slender 60” wide tub area. You may be thinking – you’ve got to be a magician to fit a walk-in shower into my space. Check out the 7 tricks below and see you how you can convert your bathtub into a sleek walk in shower. Learn how to gain space without breaking down the walls into adjoining rooms. Most tubs are 30” deep but the wall on the left sides of your tub can be up to 36” deep. 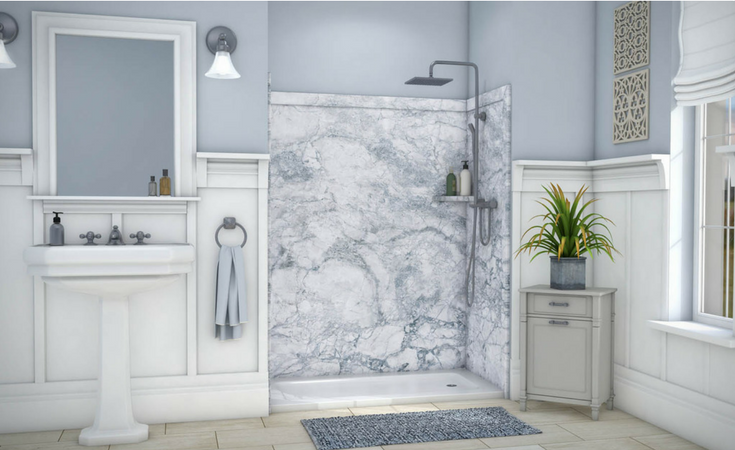 What you may not realize – and it doesn’t take any advanced math to figure this one out – is if your side walls are 36” deep when you bring your shower out to the end of the wall you’ve now gained 20% more space for a walk-in shower. You may say but Mike I don’t have 36” on these sides walls. Well – here’s another trick. If you use a curved shower pan which bows out in the front (they are 36” in the center and 30” at the side walls) you’re still creating more shower space with the same shallow side walls. Now that’s a tip Beyonce would resemble! Back in my business school days at Carnegie-Mellon (note: I was a mini “Alex P. Keaton” of Family Ties type – a true business school geek) we used to talk in classes about “hot topics” like barriers to entry in markets (I bet this sounds exciting to you as well – ha! ha). For those of you who aren’t business geeks, barriers to entry in business are how hard it is to get started in a particular industry. 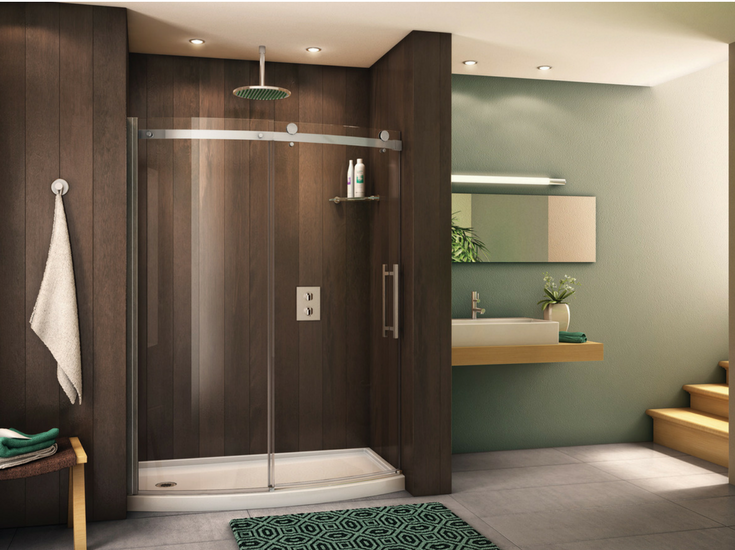 In tubs and showers there too can be barriers to entry which prevent you from entering your space as well. This barrier to entry is the shower curb (or threshold as some call it) which “defines” the shower space. This 4” to 6” curb may seem like no big deal to your 18-year-old son, but to you (or your Mom or Dad) climbing over a shower threshold can be a life altering experience (ask anyone who has dealt with a family member with a broken hip). What can be done about this? It’s simple – ditch the curb. There are 2 ways to accomplish this. 1) Use a ramped in barrier free entry. You can use a ready for tile shower pan or a solid surface shower base to create a slightly ramped entrance which makes it simple to get in. 2) Go one level. 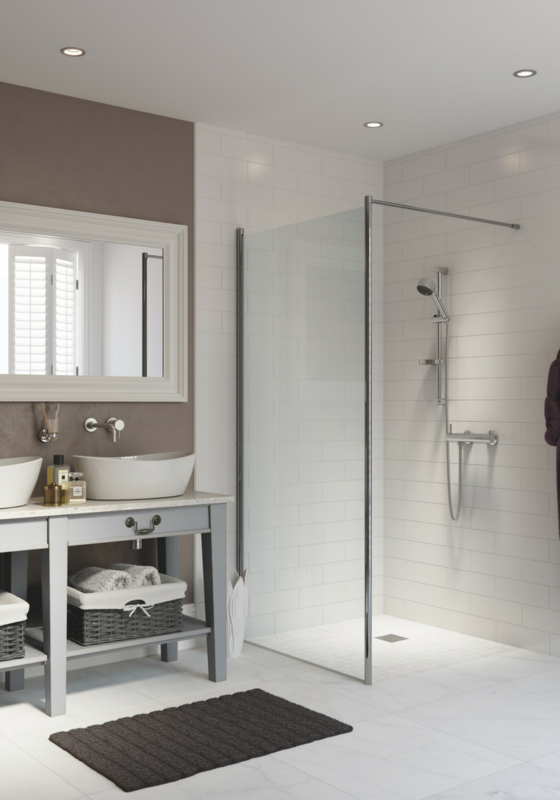 With one level bathroom, your shower no longer is a separate unit – but the shower and bathroom floor are continuous. This is a fantastic technique for small bathrooms – and it also has a contemporary sleek feel. I love the line in Scarface with Al Pacino where he says (as he brings out the shotgun), “so hello to my little friend.” When people think of plumbing they think of it as a pain in the a**, not that plumbing can be their “little friend.” They think about what can go wrong with plumbing – not how plumbing can make a bathroom cooler and more functional. When you convert a tub into a shower you have to rethink your plumbing by default because you’ll need to convert from a 1 ½” pipes to a wider 2” line for the increased water flow of a shower. While you’re doing this it’s an opportunity to add style to your plumbing. 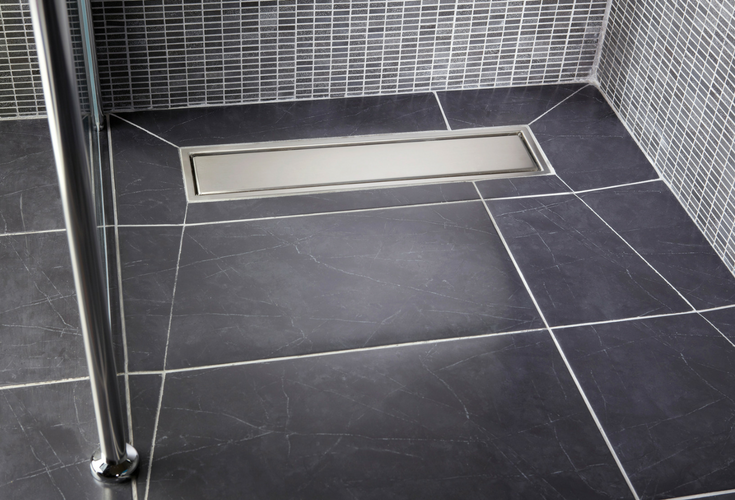 One trick to making your space cooler through plumbing is by using a sleek linear shower drain. They are available with “hidden plates” (so you can’t tell a drain is there) and assist in moving water quickly out of the shower so you’re not standing in a pool of water when your drain clogs. One negative of a walk-in shower in a tub space (vs. a shower enclosure closed off by a door or curtain) is it’s open. While this is a legitimate concern, a luxurious way to counteract this problem is adding an in-floor radiant heating system. This will make a shower super comfortable and give you a spa-like feeling. 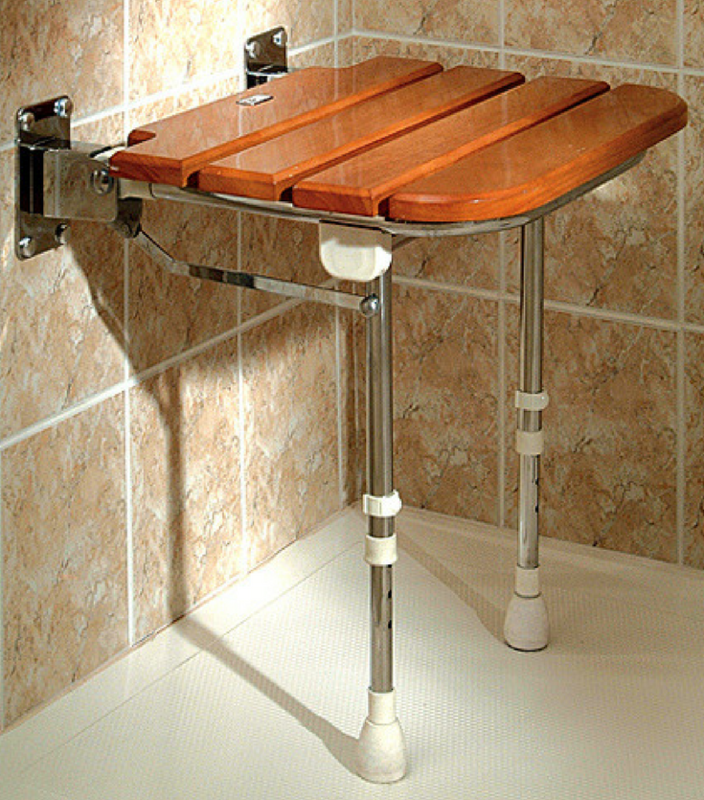 Also, if you’d like the ability to sit down while shaving your legs or simply to relax and let water from a rain shower gently fall on you, it’s possible to do this in a small walk in shower using a fold down bench seat. Fold it out when you want to relax. Fold it up when you need the space for a quick shower before heading off to work. The smaller the space – the smarter you have to be with your storage. You need to find those “hot pockets” of storage for soap, shampoo, loofa sponges or lotions and potions which seem to be growing exponentially as you get older. The best way to accomplish this is go “inside vs. outside.” Instead of putting your shampoo bottles on the bathroom floor (an accident waiting to happen) or hanging an ugly “shower caddy” over the shower head (tacky – BIG TIME!) build niches into the wall cavities during construction. They are safer, look nicer and don’t take up any room inside the shower. 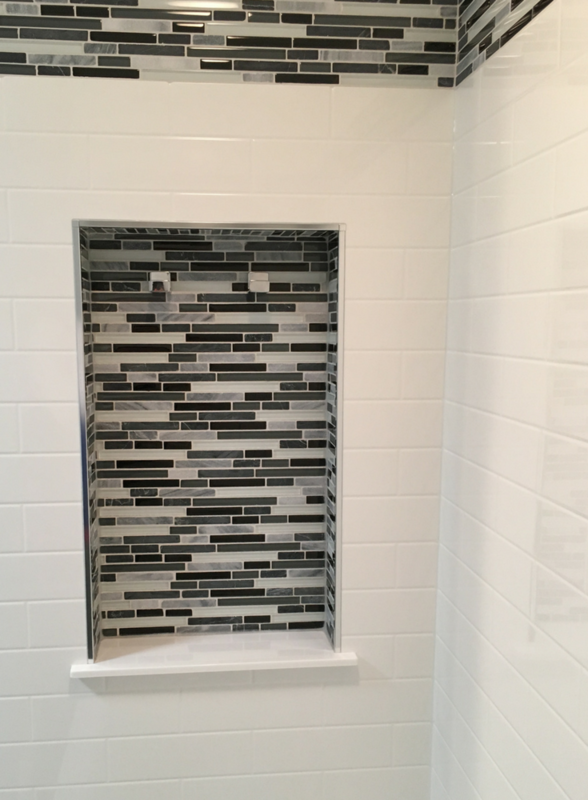 This glass tile niche was used inside a grout free shower wall surround system made of solid surface stone. Do the tile grout joints of your existing tub infuriate you? Are you so tired of continually cleaning these joints you want to scream? If your Mom ever said “I’ve had it up to here” (note – I’m not sure where “here” ever meant – sorry Mom) you may know this feeling with the tile surrounding your tub. When you’re doing a tub to shower conversion this is your chance to stop the madness of maintaining tile grout joints. The options in slick shower surround panels is exploding. There are laminated wall panels, decorative PVC systems, solid surface units and sleek high gloss contemporary walls. Don’t “take the easy way out” and allow your remodeler to force you to install tile walls (because that’s the way he always does it). Take back your life. Take back your time. Ditch tile walls for wall panels and eliminate this one nasty task (cleaning tile grout joints) from your life. You can even get waterproof wall panels which feel like tile – but with no grout joint to clean! When you think of “bling” who thinks of showers…..’er almost no one! But a glass shower wall can be an expression of your individuality and style. 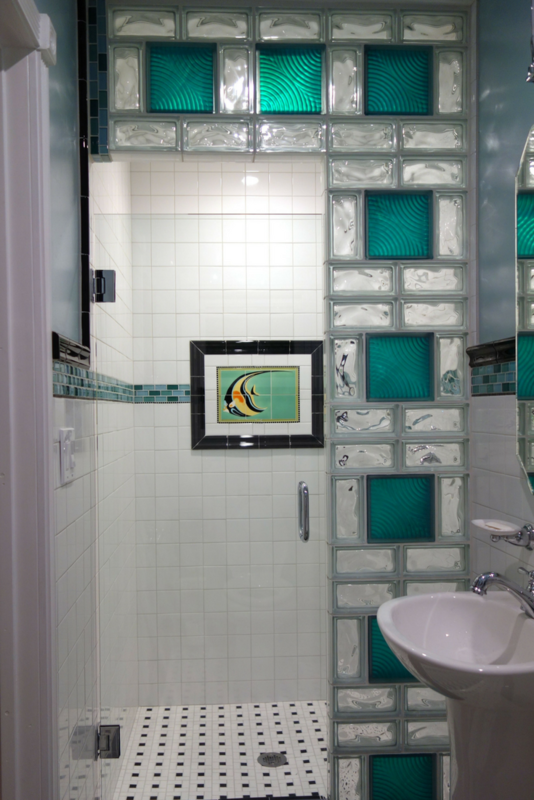 Some fun ways to do this are to create a colorful or mosaic design with glass blocks. These building blocks are being reinvented today with designs, colors, patterns and textures which aren’t possible with any other building material. Another option to add some expressive bling is with decorative, colored or etched glass walls. They add distinction and a touch of fun to a bathroom. Has your time come to stop dealing with the frustration of an outdated, unsafe and high maintenance tub? I hope these 7 tricks have given you some hope that there is a better way to use your precious tub space and enjoy a walk-in shower. If you need help or would like a free consultation for a walk in shower design call us at the numbers below or add your comments to this post. We’d love to hear from you! If you’re looking for more information or an estimate on remodeling a shower or nationwide material supply for wall panels and shower bases call The Cleveland Design and Remodeling (216-658-1270), The Bath Doctor in Columbus (614-252-7294) or for nationwide supply Innovate Building Solutions (877-668-5888). Absolutely Kenna – we are in the process of completing a display in our showroom and are showing this idea in one of our vignettes. We have seen a lot of fun ideas combining grout free shower wall panels with tile borders as well! I’m glad these ideas inspire you – they do us as well. I totally agree with Carol! I had no idea you could put a glass tile niche inside a grout free shower wall surround system. We are in Tennessee, but I’d love to learn more about that as an option! And who knew there were that many colors to pick from?